* Pwr+ products are CE/FCC/RoHS certified. * Products trademarked Pwr+® are marketed and sold exclusively by Pwr+. We focus on providing quality power products and excellent customer service ... and we also ship your order the same or next day (Amazon order processing time varies) ! 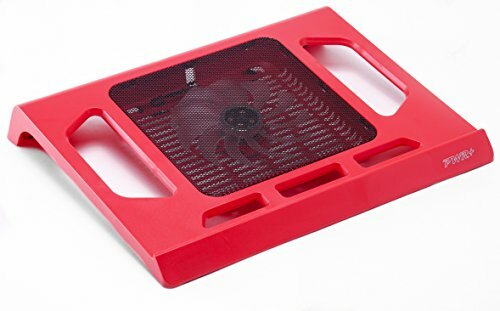 Product Description : Pwr+ Laptop Stand helps reduce the operating temperature of your laptop and allows for steady airflow around it. It uses active cooling methods to distribute air quietly and evenly under the base of your laptop or netbook. Powered by your laptop's USB port (usb cord is included), two silent fans use so little energy that it won't even have any impact on the battery life. Wherever it is used - be it a desk, sofa, bed or your lap - Pwr+ table provides a most comfortable typing angle and reduces neck and shoulder stress thanks to its unique design and shape.